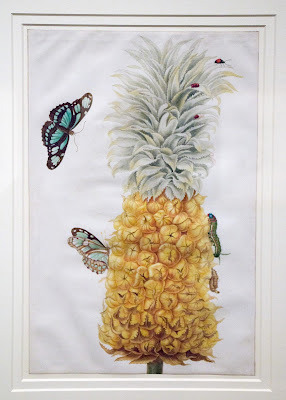 I recently visited the Queen’s Gallery, Buckingham Palace, London, for a curator-led tour of the new exhibitions: Scottish Artists 1750-1900: From Caledonia to the Continent and Maria Merian’s Butterflies. 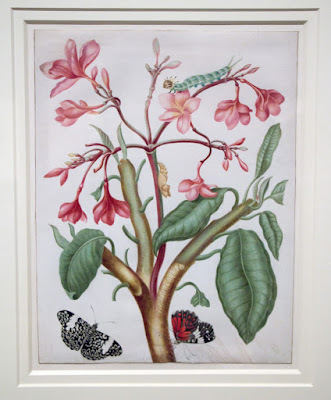 This post is about the second exhibition: Maria Merian’s Butterflies. 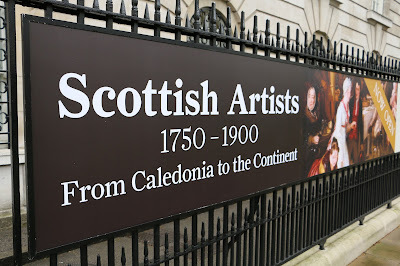 You can read my blog about the Scottish Artists exhibition here. 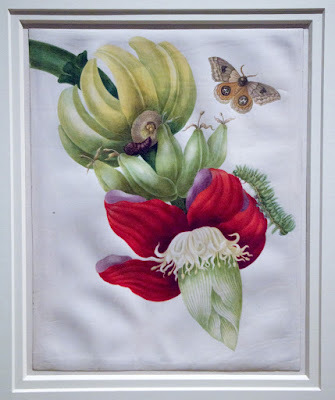 I confess that I wasn’t at all sure that I would be interested in Maria Merian’s work. After all, she was born around 100 years too early for me and died just three years into the reign of George I. However, I knew that the pictures on display had all been acquired by George III and so I had my Georgian connection. 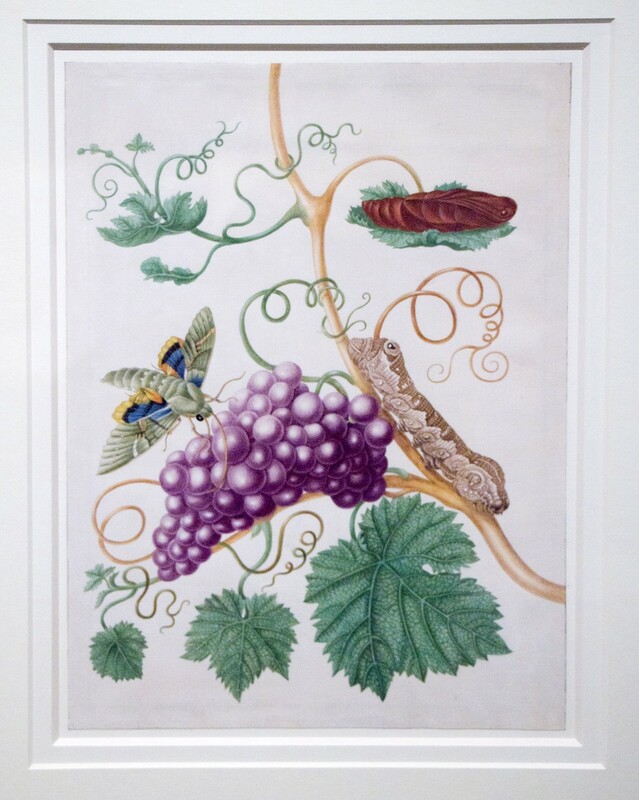 I prefer paintings of people and places rather than plants and animals, but I have to admit that Merian’s work is stunning. Maria Sibylla Merian was born in Germany but later settled in the Netherlands. Encouraged by her step-father, Jacob Marrel, she became a skilled artist, specialising in painting plants and insects. 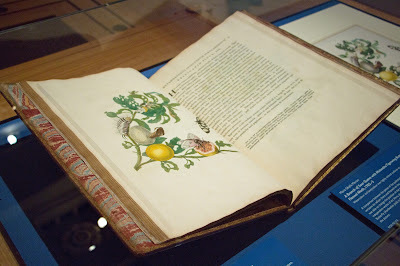 But Merian was not just an artist. She had an enquiring, scientific mind and wanted to know more about the insects she was painting. Metamorphosis was little understood at the time and she bred insects so that she could observe their lifecycles and documented what she saw in meticulously accurate paintings. In 1699, Merian travelled to Suriname in South America with her daughter Dorothea so that she could study insects in their natural habitat, selling her own paintings in order to finance the voyage. She had hoped to stay for five years but was forced to return to the Netherlands in 1701 due to ill health. She published the results of her observations in Metamorphosis Insectorum Surinamensium (The Metamorphosis of the Insects of Suriname) in 1705, in Latin and Dutch, and it became an important source for Georgian scientists. The book was full of prints of her incredibly detailed life-size paintings, illustrating the different stages of the lifecycles of various caterpillars. Some copies were in black and white; others she hand-coloured with utmost accuracy. She financed her self-publishing venture by producing luxury prints of her paintings. There are only two sets known to be in existence – Hans Sloane’s set which is now in the British Museum and the set in the Royal Collection. 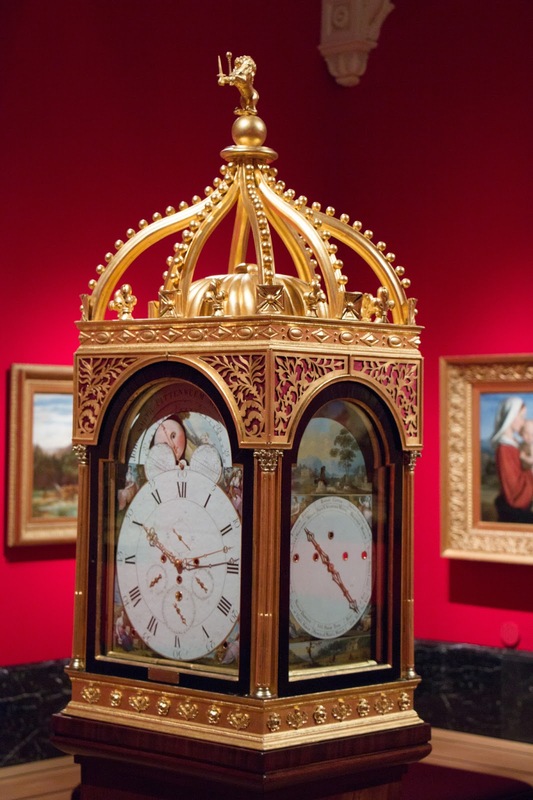 These were acquired by George III some time before 1810 when they appear in a royal inventory. Many of these prints were on display in the exhibition. The copy of Metamorphosis Insectorum Surinamensium on display was acquired by William IV for the royal library. The curator explained how this copy was particularly exclusive because it was a counterproof version. As I understand it, this means that a print was made from the plate and then this print was immediately used to make another print. The result was a faint but exact copy of the original, without print marks, which would then be finished by hand. This made it a very expensive luxury product. As well as insects, Merian painted watercolours of frogs, showing their lifecycles, and a few other creatures such as the Cayman crocodile. One treat that I almost missed was in the Millar Learning Room, which you can find to the left of the entrance stairs. There was a touchscreen showing a picture of a branch with several different caterpillars on it from Merian’s watercolours. Touching one of these caterpillars started a short animation of the lifecycle of that caterpillar, using Merian’s illustrations. My husband took a short video of one of these animations. Maria Merian’s Butterflies is on at the Queen’s Gallery, Buckingham Palace, London, alongside Scottish Artists 1750-1900, until Sunday 9 October 2016. Last Friday, I was delighted to visit the Queen’s Gallery, Buckingham Palace, London, for a bloggers’ breakfast and curator-led tour of the new exhibitions—Scottish Artists 1750-1900: From Caledonia to the Continent and Maria Merian’s Butterflies. In this post, I will look at the first of these exhibitions—Scottish Artists. 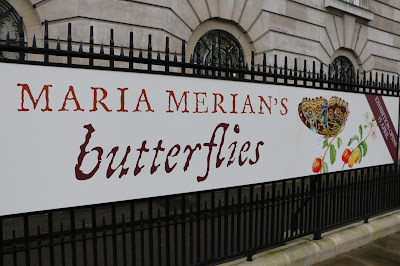 You can read about Maria Merian’s Butterflies here. 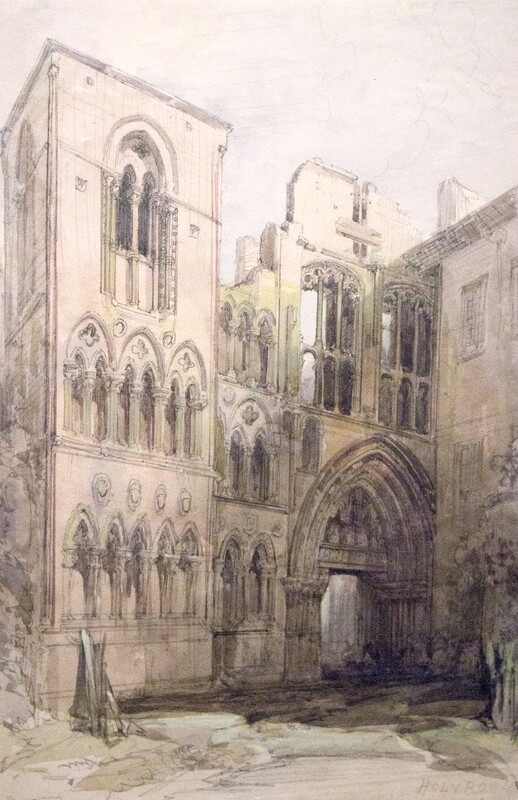 The Scottish Artists exhibition is a sumptuous display of Scottish art from the Georgian and Victorian periods. But what constitutes Scottish art? I wasn’t sure whether to expect pictures of Scotland or works of art by Scottish artists. The exhibition curator was quick to explain that the exhibition was of works of art by artists born in Scotland, wherever they subsequently worked. The first room was dominated by the work of two major Scottish artists of the Georgian period: Allan Ramsay and Sir David Wilkie. 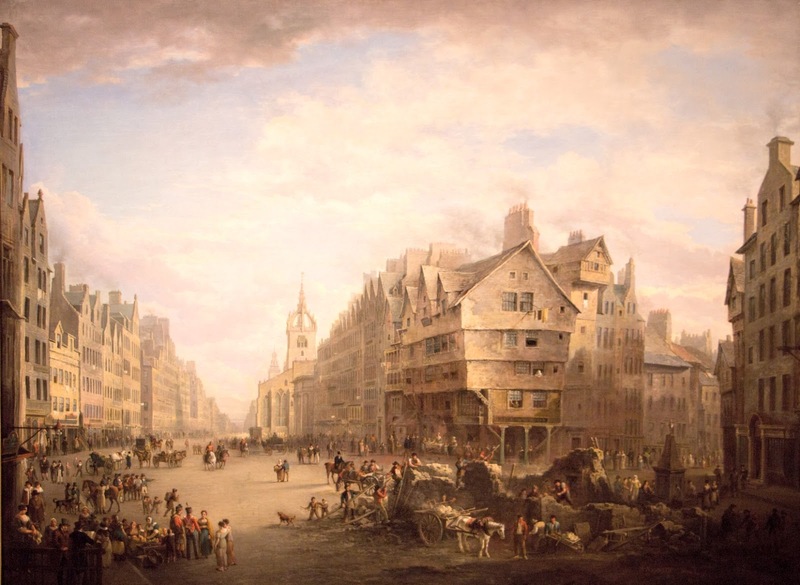 Allan Ramsay (1713-1784) was born in Edinburgh and was patronised by George III, having been introduced to him by fellow Scotsman, Lord Bute. He was commissioned to paint the state portrait of George III in his coronation robes—a picture with which I am very familiar. Part of the reason for this is no doubt that there are a lot of copies of this portrait around. 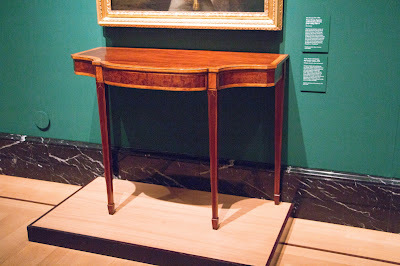 It was reproduced more than 150 times by Ramsay for members of the royal family, courtiers and the like. 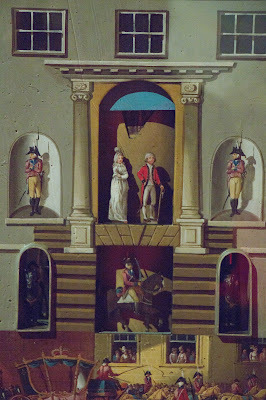 The curator assured us that it was the prime version of the state portrait which was on display. 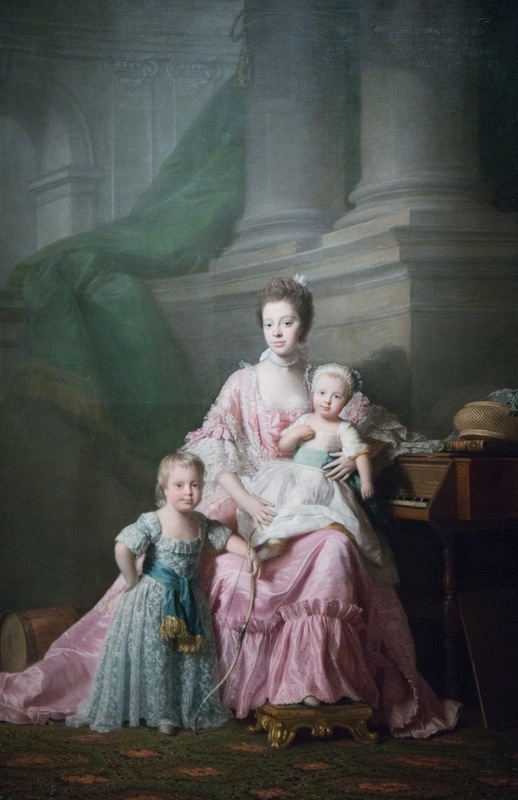 Alongside the state portrait of George III was a picture of his wife, Queen Charlotte, in a less formal setting, with the toddling George IV by her side and his younger brother Frederick, Duke of York, balanced on her lap. The young George, Prince of Wales, aged about two, could be mistaken for a girl as he is wearing a long dress. 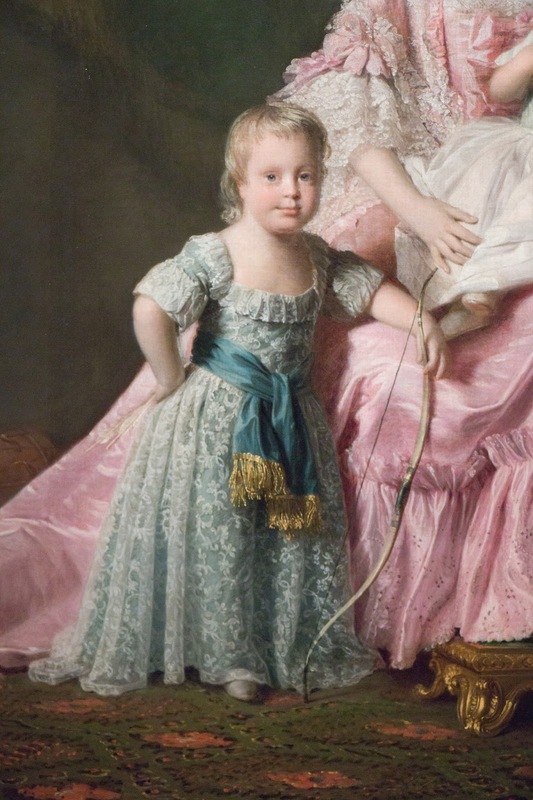 This is because at this time, boys wore dresses or ‘coats’ until the age of around four to seven when they were breeched, that is, put into trousers for the first time. I love the way that George is pictured with one hand on his hip and a bow in the other. On an adjacent wall were three more Ramsay portraits including a charming one of William IV as a small boy before he was breeched playing a drum bearing his father’s royal cipher. Born in Fife, Sir David Wilkie (1785-1841) rose to even greater fame than Ramsay had done. George IV appointed Wilkie as His Majesty’s Painter and Limner in Scotland in 1823 and then Principal Painter in Ordinary to the King in 1830, before knighting him in 1836. 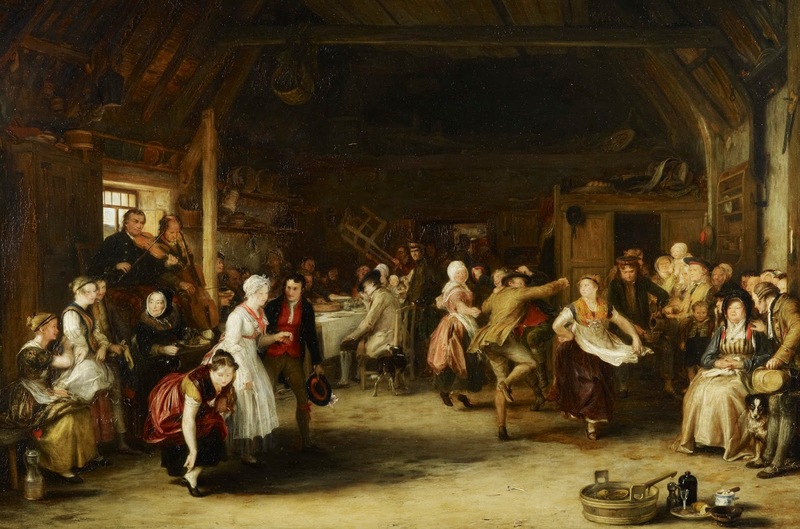 Two of Wilkie’s early royal commissions were on display—Blind-Man’s Buff and its companion piece, The Penny Wedding—together with a number of later works that he had painted on the continent. 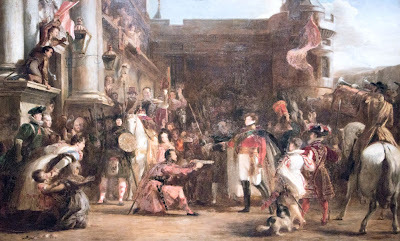 My favourite Wilkie piece was undoubtedly The Entrance of George IV to Holyroodhouse. The painting depicts George IV’s arrival at Holyroodhouse Palace on 15 August 1822 during his tour of Scotland—a significant visit as he was the first reigning monarch to travel north of the border for almost two hundred years. 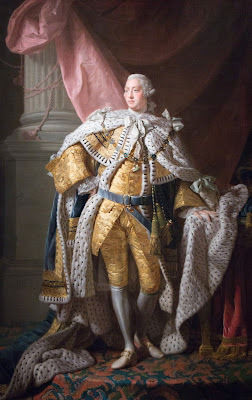 This picture reminded me that George IV did occasionally get things right as his Scottish tour was a great success! 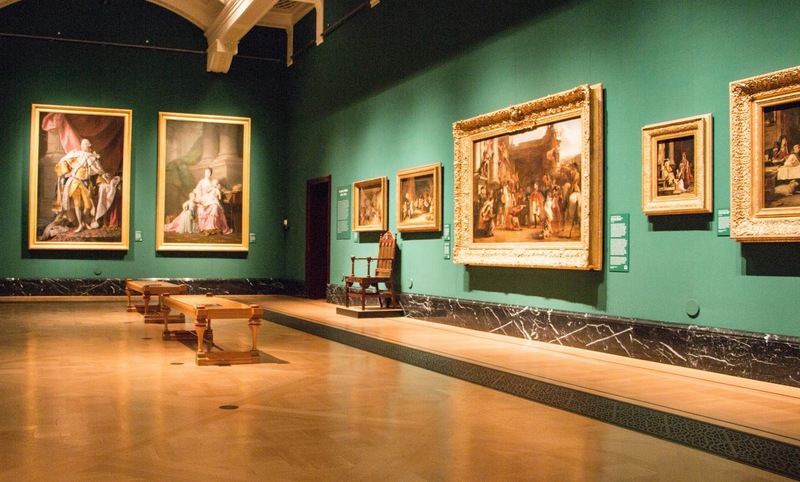 The second large display room was dominated by the works of Scottish artists patronised by Queen Victoria. 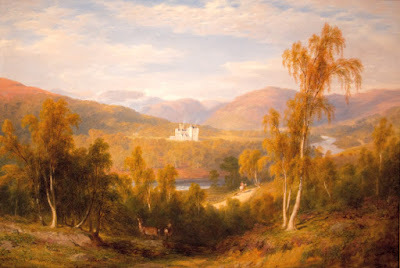 These included paintings by David Roberts (1796-1864), James Giles (1801-1870), Sir Francis Grant (1803-1878) and William Dyce (1806-1864), as well as some by her favourite artist, John Phillip (1817-1867), such as The Dying Contrabandista. 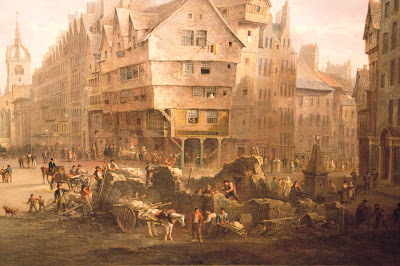 As usual, I was looking at the exhibition from a Georgian point of view and was glad to spot a few earlier pieces in the room, including Ruins of the Abbey of Holyrood (above), painted by David Roberts in 1823, and a wonderfully detailed painting of Georgian Edinburgh—View of the High Street Edinburgh and the Lawn Market (below)—painted by Alexander Nasmyth (1758-1840) in 1824. 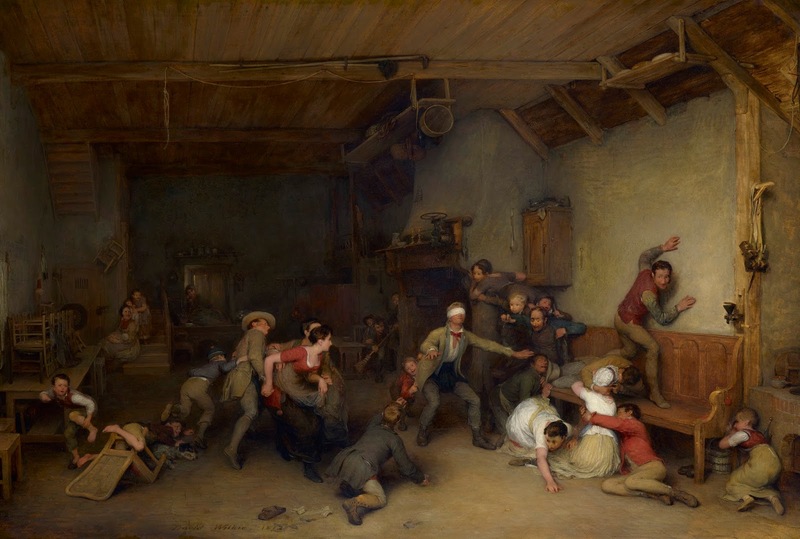 There were also several paintings by Wilkie. I loved his painting of Queen Adelaide with Princess Victoria and Members of Her Family showing the 11-year-old Queen Victoria’s first court appearance at St James’ Palace on 24 February 1831. 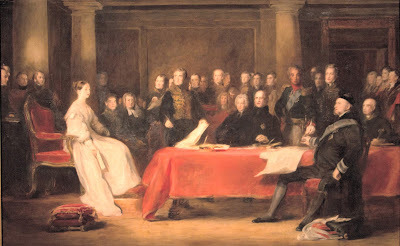 A later Wilkie showed another momentous occasion in Queen Victoria’s life—The First Council of Queen Victoria on 20 June 1837, shortly after becoming Queen. 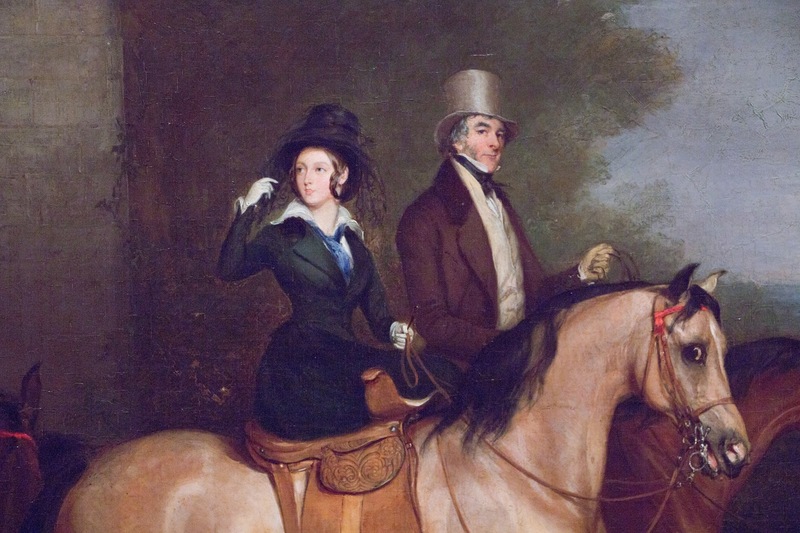 Unfortunately, Queen Victoria did not like the picture and Wilkie fell out of royal favour. Amongst the Victorian miniatures in one of the side rooms, I spied a couple of Georgian princesses: Princess Elizabeth and Princess Sophia. 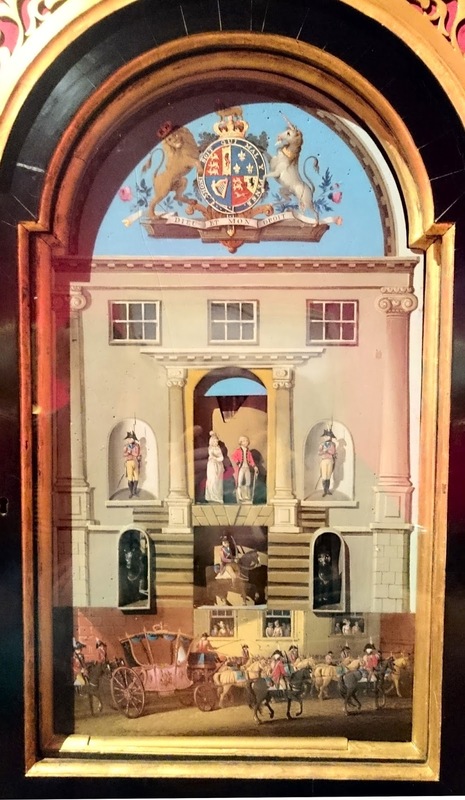 They were both painted in 1807 by Andrew Robertson (1777-1845) who was Miniature Painter to the princesses’ brother, Augustus, Duke of Sussex. The main exhibition rooms also had several items of furniture and sculpture on display. 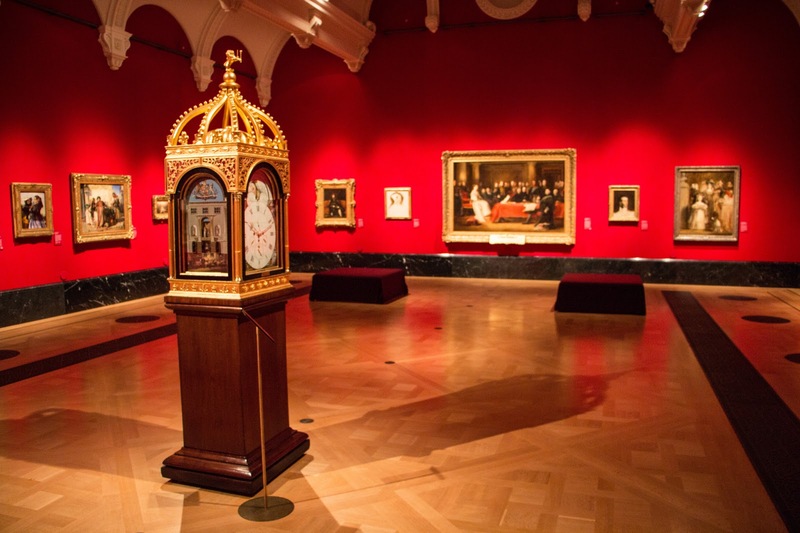 These included a pair of pier tables and a writing table supplied to the Palace of Holyroodhouse in 1796; a marble bust of Adolphus, Duke of Cambridge, 7th son of George III; and the most incredible pedestal clock. The clock was made by John Smith of Fife c1800-1808 and was exhibited by him in London in 1808. It was both an automaton and a musical clock with a choice of 16 tunes to play and two sets of figures—the higher one of the royal family and the lower one of members of the royal household—who would promenade across one face of the clock every three hours. Don’t forget to pick up a media guide for the exhibition if you are visiting. 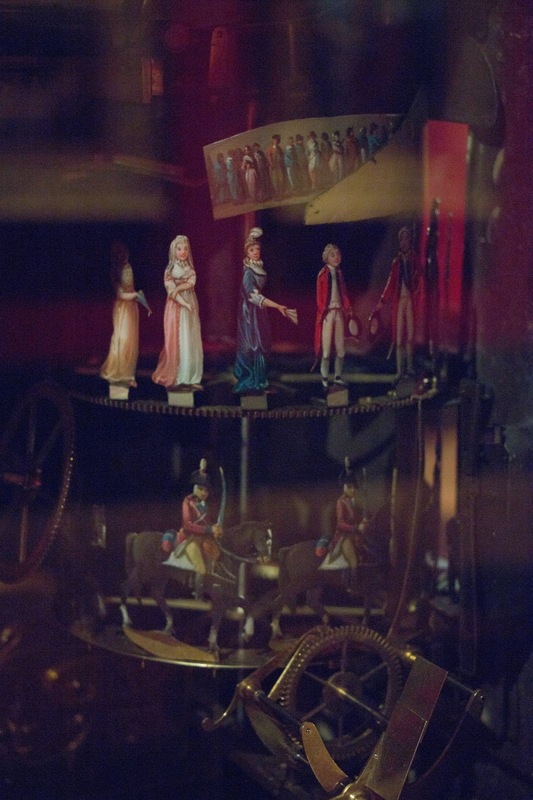 By selecting the section on the clock it is possible to see the clock in full operation with its music playing and its figures processing around the clock. Scottish Artists 1750-1900: From Caledonia to the Continent is on at the Queen’s Gallery, Buckingham Palace, London, alongside Maria Merian’s Butterflies, until Sunday 9 October 2016. 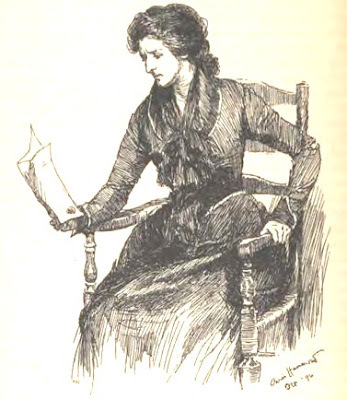 Unlike most novels today, the text of Belinda was altered in subsequent editions. The second edition, published in 1802, included only minor revisions and it is this text, republished by Oxford World’s Classics, on which this post is based. 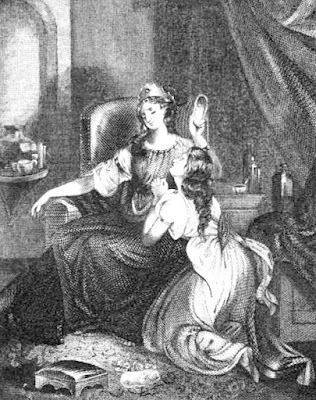 However, there was a later version of Belinda which was included in Mrs Barbauld’s British Novelists Series published in 1810 and this text had some significant differences from the previous editions. The main purpose of these revisions was to bring it into line with the widely held values of the time and make the characters conform more to the ideals of the romantic novel. The changes included removing any hint of an interracial marriage, playing down the possibility that Belinda would ever marry the Creole (2) Mr Vincent and completely eliminating the marriage between Mr Vincent’s black servant and an English girl. Belinda is the story of Belinda Portman and how she learns to depend on her own judgement and not the advice of others, particularly in making that all-important decision of who to marry. Belinda’s aunt, Mrs Stanhope, has gained a reputation as a scheming matchmaker for successfully marrying off her other nieces. In her efforts to achieve a good match for Belinda, Mrs Stanhope has successfully ingratiated herself with Lady Delacour, a fashionable society hostess, who invites Belinda to go with her to London. Belinda soon discovers that Lady Delacour’s dazzling public persona is a sham and that at home, she is miserable and continually at odds with her dissolute husband. Lady Delacour’s most ardent admirer is Mr Hervey, a clever but rather arrogant young gentleman who wants people to think he does everything best. Belinda likes Mr Hervey, but won’t allow herself to fall in love with him because she fears he is too entangled with Lady Delacour to be free to form an attachment. Belinda goes to a masquerade ball and, at Lady Delacour’s insistence, swaps costumes with her at the last minute. 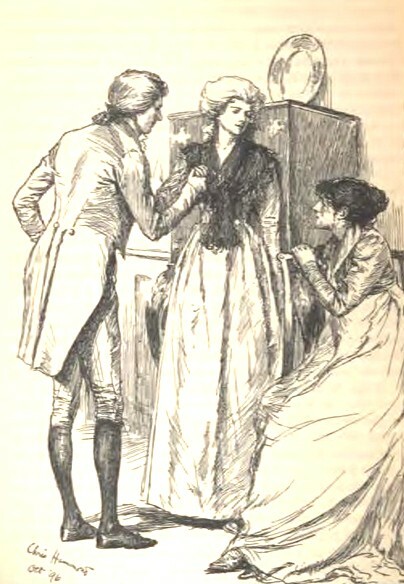 As a result, Mr Hervey mistakes her identity and talks openly in front of Belinda of her aunt’s reputation for matchmaking and condemns Belinda herself. Lady Delacour responds to Belinda’s distress by telling her that she is dying and sharing her sad story. As a beautiful heiress, she had been much courted and had fallen in love with a man named Henry Percival who loved her, but refused to overlook her faults and would not blindly flatter her. As a result, she had chosen to marry the admiring Lord Delacour instead who needed her money and whom she thought she could master. Unfortunately Lady Delacour had managed to offend her husband’s manservant, Champfort, who told his master that everyone said that his wife ruled him. “I am not a man to be governed by a wife,” became his habitual reply to her demands. 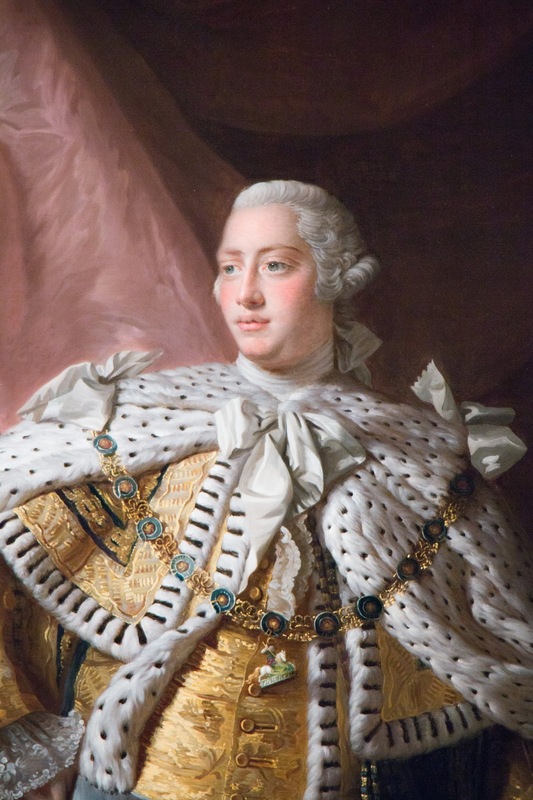 Through high living and gambling, Lord and Lady Delacour exceeded their income and argued perpetually about money. Lady Delacour suffered the heartache of a stillborn son and then the death of her first daughter whom she struggled to feed herself, as was the fashion. 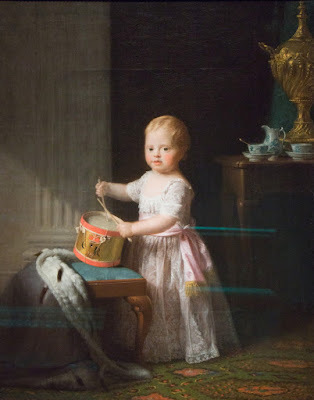 Her second daughter, Helena, was put out to nurse and then sent to school and she had little to do with her. Deprived of domestic felicity, the lonely Lady Delacour became intimate friends with the audacious Harriet Freke. In an attempt to provoke her husband’s jealousy, Lady Delacour flirted wildly with Colonel Lawless, but due to a prank of Harriet Freke’s making, the affair seemed more serious than it really was and Lord Delacour killed Lawless in a duel. Lady Delacour felt that Lawless’ blood was on her head. 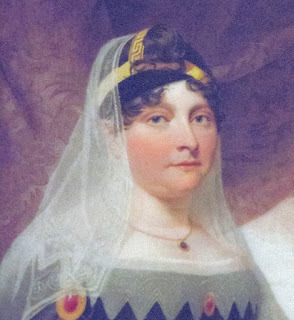 Mrs Luttridge was loud in her defence of Lord Delacour and became Lady Delacour’s bitter rival. Mrs Luttridge canvassed for her husband in an election; Lady Delacour supported a cousin of Harriet Freke’s. 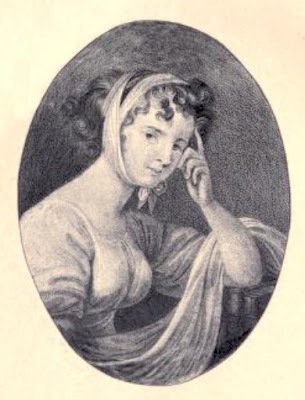 Mrs Luttridge expressed a wish of being a man so that she could meet Lady Delacour in a duel. Encouraged by Harriet Freke, Lady Delacour issued a challenge. They met in men’s clothing, but Lady Delacour’s pistol recoiled and injured her breast. She refused to let anyone treat her out of fear of detection. As a result, the wound had got worse and, she believed, turned cancerous. 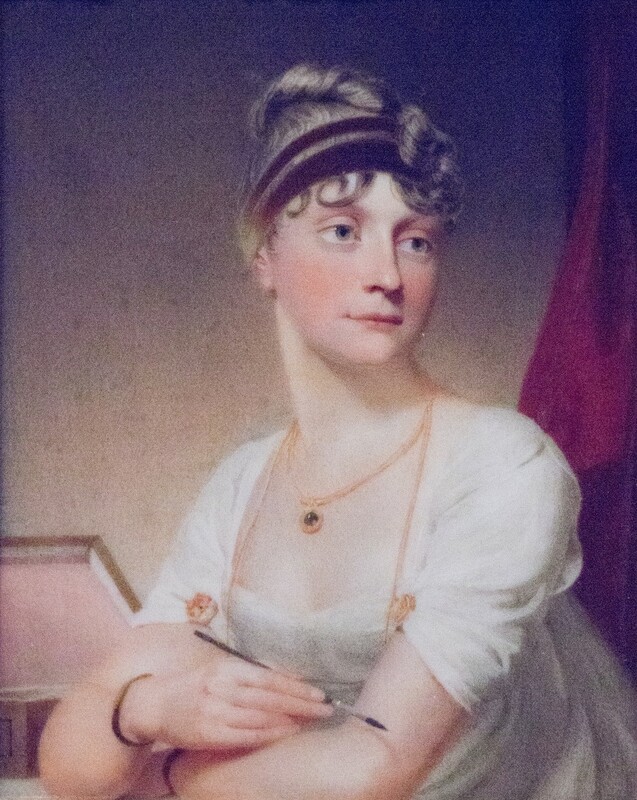 After ten years of friendship, Harriet Freke had broken off with Lady Delacour and gone over to Mrs Luttridge who had agreed to support Harriet’s husband in an election. 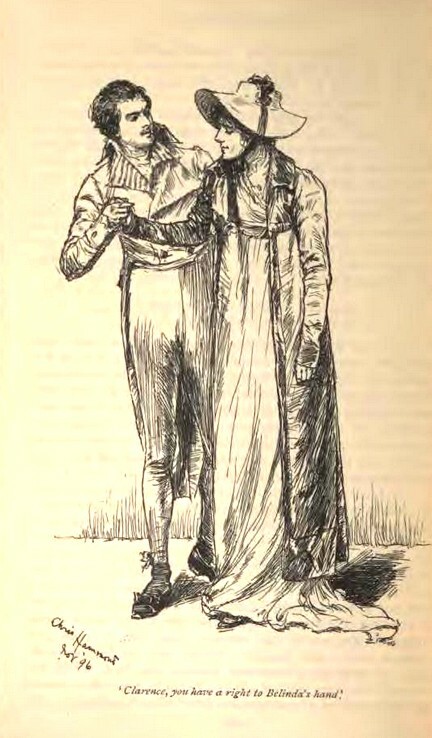 Lord Delacour had most unfortunately pledged his vote for Mr Freke as a favour to Mrs Luttridge. 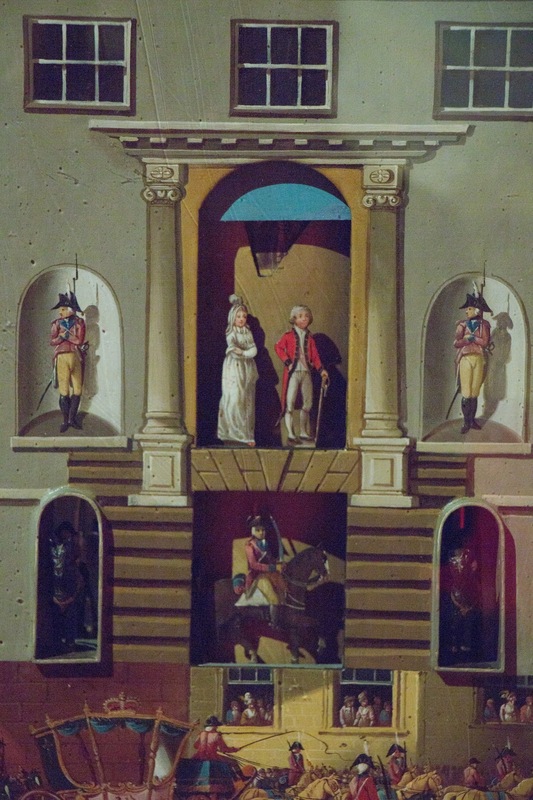 Lady Delacour is desperate to outshine Mrs Luttridge with her new equipage and persuades Mr Hervey to buy her a pair of horses that her husband has refused to let her have. Belinda lends her some money so she can pay Mr Hervey for the horses, but later discovers that she has used the money to pay for a new carriage instead. Mr Hervey asks Lady Delacour to make his peace with Belinda for the unfortunate words she overheard. Always determined to prove his superiority, Mr Hervey runs a race with his dissolute buddies, Sir Philip Baddeley and Mr Rochfort, and then dives into the Serpentine, despite not knowing how to swim. Mr Percival saves him from drowning while his friends look on. 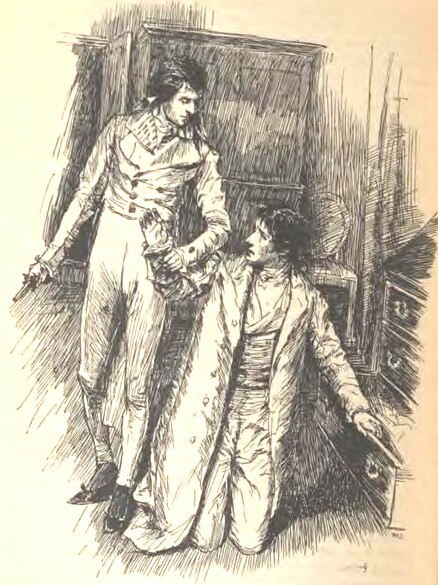 Mr Hervey is hurt by his erstwhile friends’ indifference to his plight and abandons their companionship for that of Mr Percival and his companion, the famous writer, Dr X—, whom he has met before. Mr Hervey goes to dine with Mr Percival and finds his home a scene of perfect domesticity. He meets Lord Delacour’s sister, Margaret Delacour, and his daughter, Helena, who is staying with the Percivals. Mr Hervey is falling in love with Belinda; Belinda is trying not to fall in love with Mr Hervey. 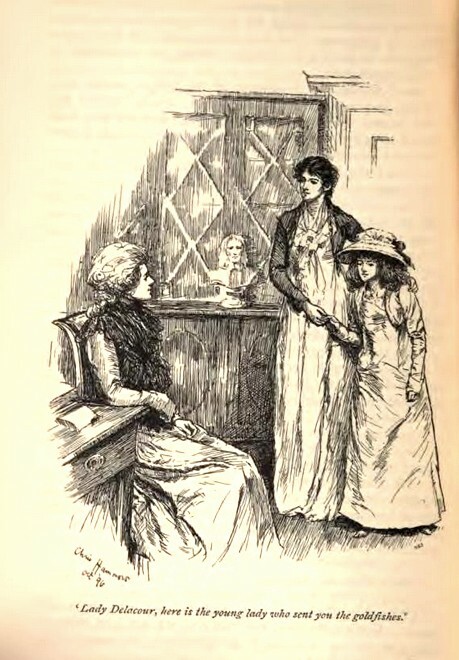 Belinda encourages Lady Delacour to develop her relationship with her daughter, Helena. Mr Hervey intends to reform Lady Delacour by attaching her to Helena and Lady Anne Percival. Lady Delacour is driven out in her new equipage, but in an effort to keep ahead of Mrs Luttridge’s carriage, her vehicle is overturned and she is hurt. She is carried up to her room but is terrified that her deformity will be detected so won’t admit to the pain she is in. Marriott refuses to let Lord Delacour enter his wife’s boudoir leading him to the false conclusion that his wife is hiding a lover in her boudoir. He then suggests, in Mr Hervey’s hearing, that it is Belinda’s lover in there instead. 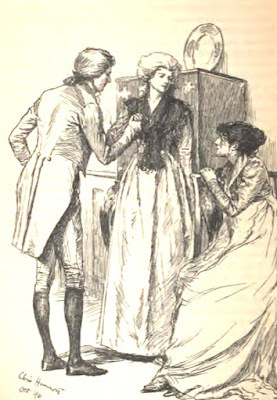 Belinda insists that Lady Delacour sees a physician and she agrees to see Dr X—. Belinda shows him the boudoir and tells him about Lord Delacour’s misunderstanding and asks Dr X— to confirm her innocence to Mr Hervey. Mr Hervey’s old friends are chagrined that he has cast them off and hearing rumours that he has a mistress, they manage to gain sight of the mysterious Virginia St Pierre. When Belinda sees a lock of Virginia’s hair in Mr Hervey’s possession, she concludes that he has another attachment and becomes cold in her attitude towards him. 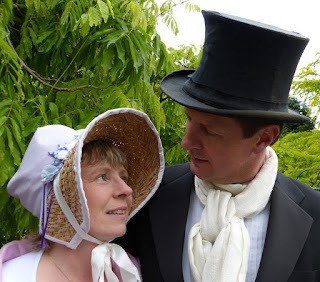 Hoping to better Mr Hervey, Sir Philip Baddeley proposes to Belinda, but she refuses him. In an effort to quash his rival’s chances, Sir Philip tells Lady Delacour and Belinda’s aunt about Mr Hervey’s longstanding attachment to Virginia St Pierre. 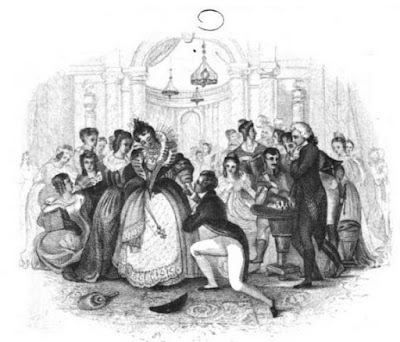 Lady Delacour complains about Marriott’s noisy macaw and Belinda goes to a bird fancier to see if she can find a quieter bird to console Marriott. She meets Lady Anne Percival and Helena who are looking for a blue macaw for Margaret Delacour, so she gives them Marriott’s bird. Helena asks after her mother and offers to send a present of her goldfish which would not make any noise. Lady Delacour is delighted with the goldfish and agrees to meet the sender. The meeting with her daughter is a success. Belinda visits an exhibition where a picture of Virginia St Pierre is on display. 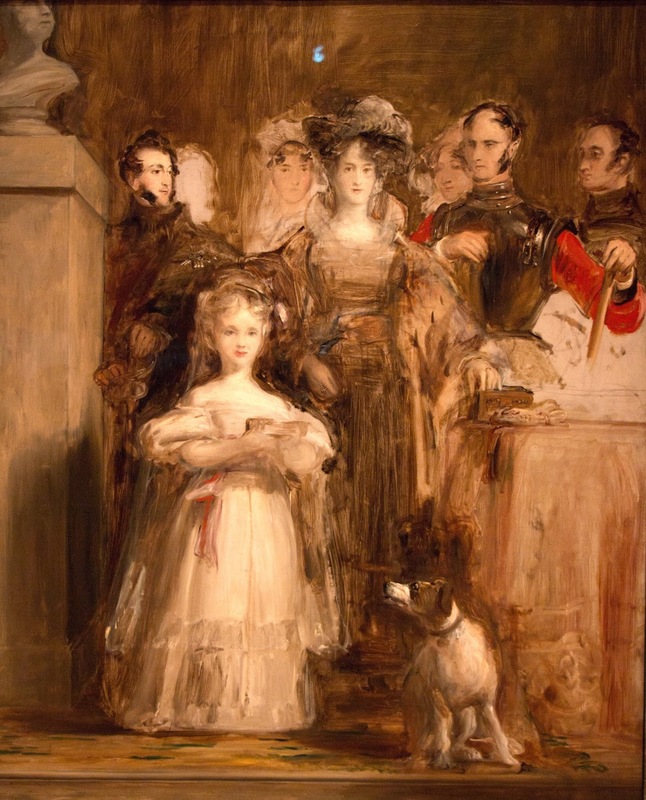 Sir Philip tells Lady Delacour that the picture is of Mr Hervey’s mistress. Meanwhile, Mr Hervey warns Belinda as a friend that it is being rumoured that Belinda would marry Lord Delacour after his wife’s death. Lady Delacour talks of having the operation that would cure her, but is so afraid of her secret coming out that she plans to use a quack doctor despite Dr X—’s warnings. Belinda urges her to tell her husband, but Lady Delacour is madly jealous of Belinda’s influence with Lord Delacour and believes she has been betrayed. Belinda cannot cope with Lady Delacour’s mistrust and goes to stay with Lady Percival at Oakly Park. The contrast between the happiness of the Percivals and the misery of the Delacours is stark. She discovers the report about her and Lord Delacour is not widely known; it later transpires that it was a malicious rumour started by Lord Delacour’s jealous manservant Champfort and poured into the ears of Sir Philip. Belinda meets Mr Vincent, Mr Percival’s ward, a handsome and wealthy Creole (2) with a black servant named Juba. Mr Vincent falls in love with Belinda, but though she knows that Mr Hervey is lost to her, he is still too dear to her to be eclipsed by Mr Vincent. Lady Anne suggests that Belinda might grow to love Mr Vincent. Belinda eventually agrees to marry Mr Vincent; she loves him but is not 'in love' with him. 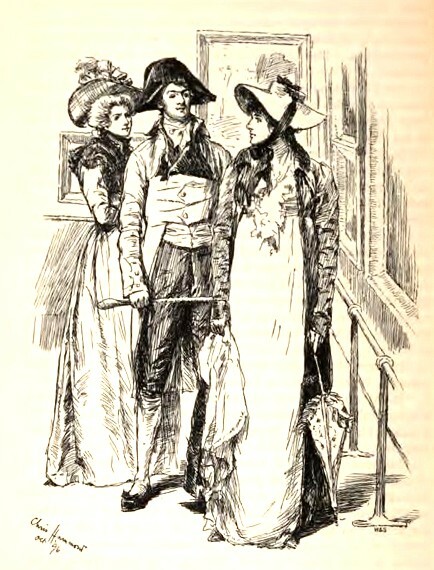 Marriott arrives saying Lady Delacour is desperately ill and Belinda agrees to return to London with her. 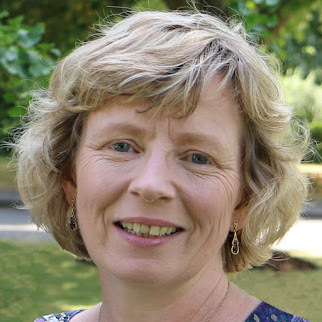 Encouraged by Belinda’s selfless example, Lady Delacour realises her husband truly loves her and reveals the secret of her condition. This is the first step in their reconciliation. Lord Delacour is touched by his wife’s confidence and stays at home to dine rather than going out and getting drunk. 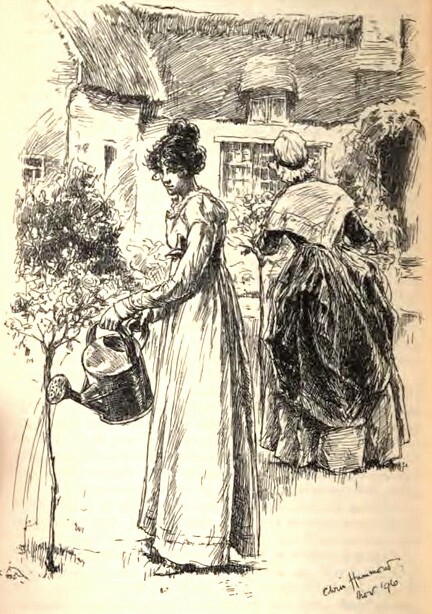 Belinda persuades Lady Delacour to send for Helena who is at school. Helena succeeds in gaining her mother’s confidence and Lady Delacour tells her the truth about her illness and her forthcoming operation. 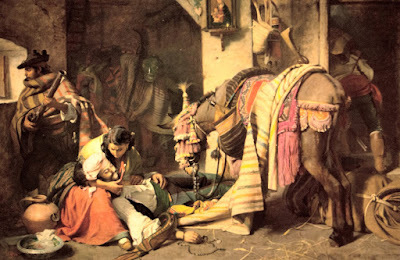 Lady Delacour goes to Twickenham to have the dreaded operation, believing that she is going to die because of a vision she has seen in the night. However, the vision proves to be Harriet Freke spying on her and when the surgeon goes to perform the operation, he finds that Lady Delacour has not got cancer after all. Helena rescues an unusual bullfinch that can sing a particular tune. Reluctantly, Marriott responds to an advert for a missing bullfinch and takes the bird to a perfumer’s shop as requested. When the bird sings its song, it has a dramatic effect on a man in the shop who is desperate to know where he can find the lady who owns it. The bullfinch belongs to Virginia St Pierre and Marriott is left in no doubt that she is under the protection of Mr Hervey. Mr Hervey sends a letter to Lady Delacour revealing the whole of his connection with Virginia St Pierre. 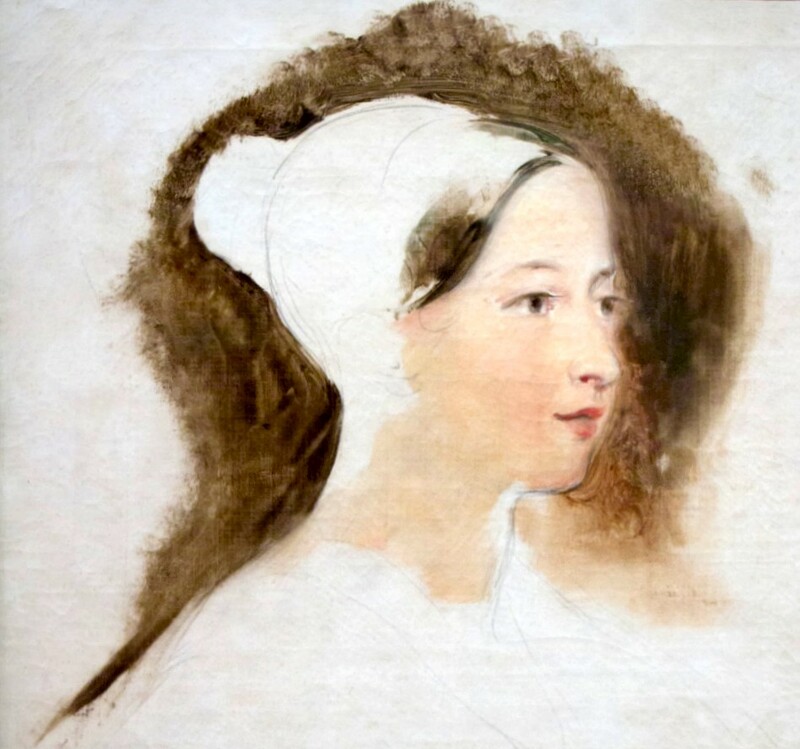 Virginia’s true name was Rachel, but Mr Hervey changed it to that of the heroine in a novel – Paul and Virginia by St Pierre – and he later had her painted in this role. Mr Hervey had happened upon the beautiful Rachel whilst riding in the New Forest where she was kept quite separate from the world by her grandmother. Mr Hervey was taken by her beauty and innocence and conceived the idea of bringing her up to be his wife. 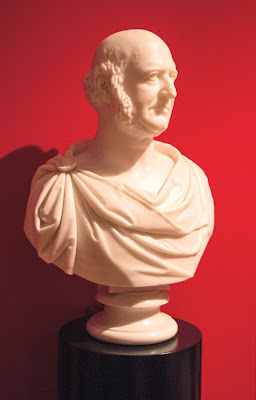 After her grandmother’s death, he took a house in Windsor for her and a companion, Mrs Ormond, and it was here that Sir Philip had espied her. Virginia’s only possession from her humble beginnings was her bullfinch. Virginia struggled to learn much, but developed a great passion for novels. Mr Hervey visited often but his plans to marry her were kept secret. After meeting Belinda, Mr Hervey had realised how inadequate Virginia would be as a wife. 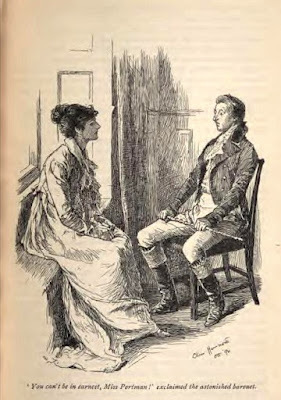 Unfortunately, Mrs Ormond was persuaded that Virginia loved Mr Hervey, and told Virginia of his plans to marry her. By chance, Mr Moreton, a clergyman whom Mr Hervey has helped, comes across a man trying to find his daughter whose miniature he has. He tells Mr Hervey that he thinks the girl in the miniature looks like Virginia. Believing that the man might be Virginia’s father, who had abandoned Virginia’s mother many years before, Mr Hervey tries to find him and exhibits the picture of Virginia in hopes that it will attract him. 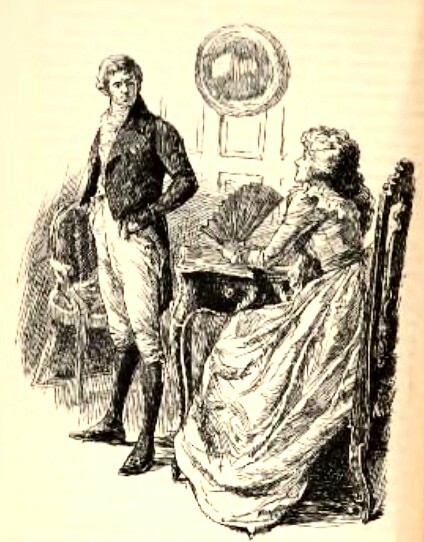 Mrs Ormond tells Mr Hervey that he has ruined Virginia’s reputation as people believe Virginia is his mistress. She confesses that she has told Virginia of Mr Hervey’s plan to marry her and Mr Hervey feels honour bound to offer for her. Mr Hervey eventually finds Virginia’s father, Mr Hartley, and he is reconciled with his daughter. Lady Delacour is concerned that Mr Vincent is visiting Mrs Luttridge’s House to play EO (3) and asks her husband to make inquiries. Having broken entirely with Mrs Luttridge since his reconciliation with his wife, Lord Delacour is unable to visit himself and asks for Mr Hervey’s help. Although Belinda is now lost to him, Mr Hervey is anxious to do her any service in his power and willingly agrees. Mr Hervey discovers that Mr Vincent is playing EO and losing lots of money, but also gains evidence that the table is rigged. He lets Mr Vincent lose everything to scare him out of gambling, but then follows him and prevents him from committing suicide. Mr Hervey tells Mr Vincent that Mrs Luttridge has been cheating and that he will be able to recoup Mr Vincent’s losses by threatening to expose her. Mr Vincent vows not to gamble again. Mr Vincent plans to confess all to Belinda, but then loses his nerve. Mr Percival asks Mr Vincent to repay a loan of £15,000, but Mr Vincent lost this at play before Mr Hervey intervened and he is too embarrassed to own the truth. He plans to borrow the sum from a moneylending Jew. Unfortunately, Juba discovers the Jew in Mr Vincent’s apartments and thinks he is a robber. The moneylender says he has come to lend not steal. Mr Vincent explains what has happened and Mr Percival agrees to tell Belinda. Belinda writes Mr Vincent a letter ending their engagement. Lady Delacour still wants Mr Hervey to marry Belinda and determines to discover whether Virginia really loves him before he irrevocably commits himself to her. She is aware that while living in the forest, Virginia had possessed for a while a miniature of a young man of which she was very fond. Lady Delacour had discovered the man in the miniature quite by chance. He was the man who was seeking the owner of the singing bullfinch. He had traced the bird to Virginia and was distressed to discover that she was Mr Hervey’s mistress. Lady Delacour eventually traced the man, Captain Sunderland, and convinced him that Virginia was not Mr Hervey's mistress. The captain had spied Virginia in the forest and fallen in love with her through a telescope! He planned to offer for her when he returned from the West Indies where he hoped to make his fortune. 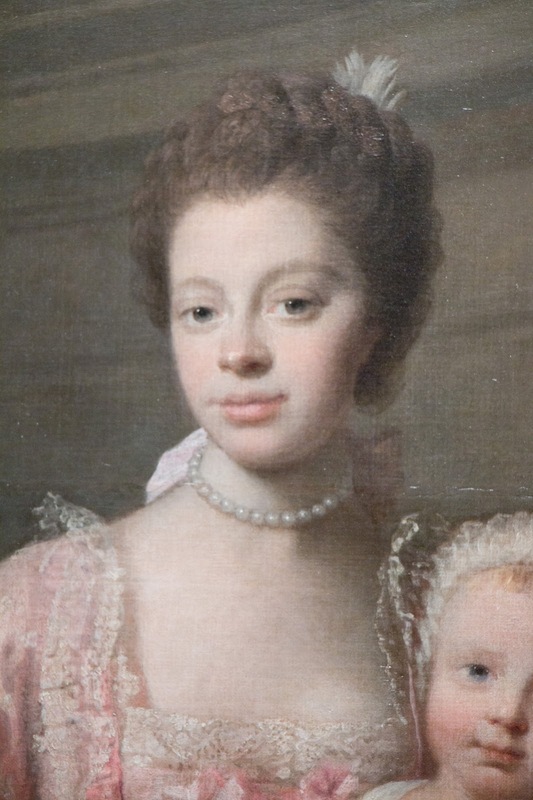 Lady Delacour persuaded Captain Sunderland to have his portrait painted in the character of Paul from the novel so she could discover if Virginia still felt anything for him. Faced with the picture, Virginia faints. She admits to being in love with the man in the painting although she has never met him! What Mrs Ormond had believed was love was merely gratitude and Virginia is relieved when Mr Hervey tells her of his devotion to Belinda. 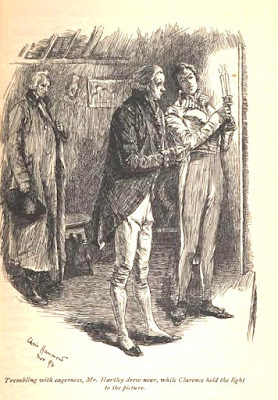 Mr Hartley arrives with Captain Sunderland who had once saved his life in the West Indies and in time, the captain and Virginia are married. Mr Hervey declares his love for Belinda and she finally admits to loving him and they live happily ever after. (1)	From a note from the author at the beginning of the second edition of Belinda by Maria Edgeworth published in 1802. (2)	A Creole is a person born in the West Indies but of European descent. (3)	EO was a popular gambling game similar to Roulette.